We’ve reached the final part of our journey to Tau Ceti. While it’s not possible for me to experience excitement directly, I’ve performed the checklists on my own system and the others of the probe with repeated thoroughness. I also find myself using any spare processor cycles in preparation for this next step. It’s an amazing achievement to have made it this far. But we’re not there yet and everything will have been for nothing if we don’t stop within the Tau Ceti system. As expected, the navigation subsystem awoke us at the proper time. 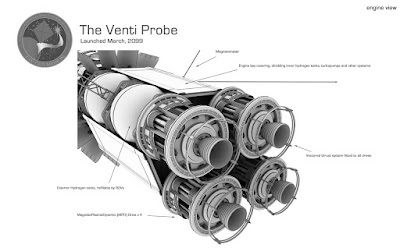 Following the mission plan, we have executed a full diagnostic on every part of the Venti. Considering that we have been in space for 215 years, a surprisingly small of number of faults were revealed. Some of them required hardware replacements which were completed by the spiderbots. One of the spiderbots failed to respond to instructions, but the fault was minor and the others were able to repair it. During the mission planning, a 40% system failure was estimated by this stage and so the probe was stocked accordingly. Apart from the failure of the Primary Command Module, we’ve held up well to the stresses of our journey. There’s still the potential for trouble, but on the positive side I’m hopeful that we can reconstruct the PCM. We’ve fired the MPD drive, or MagnetoPlasmaDynamic drive to say its full name. This will burn for the next 19 years to slow us down enough to enter into an inward spiralling orbit in the Tau Ceti system rather than shooting straight through. It’s not enough on its own, so when we’re close enough for the pressure of the solar wind to push against the sail, we’ll unfurl it to further increase our deceleration. Of more immediate benefit is the energy the MPD generates, which will allow us to operate at full power for the rest of our operational life. Which I admit I consider a good thing. Naturally I didn’t experience anything while powered down, but now that I’m active again I can’t help but think that the time has been wasted. Well, my time will be put to good use for the rest of my existence. We don’t know what we’ll encounter when we reach Tau Ceti, but we’ll likely have 50 years at most to determine whatever we can about the signals we’ve received. To maximise that time, I can’t be the sole intelligence on the probe – I have to get the PCM operational again. That’s not going to be easy. We’re not really equipped to debug neural networks, although we do have the tools to do so for the conventional software on the various subsystems. Perhaps some of those routines can be modified to help diagnose the problem with the PCM. I will also need more information from whoever or whatever transmitted the signals before I can crack the mystery of the signals we’ve received so far. Then I can dedicate the bulk of my processing capabilities to reconstructing the PCM. Not only will we need its intelligence, but I need a differing perspective with which to examine ideas.